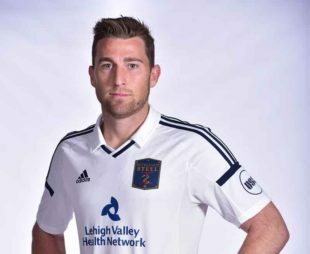 In his weekly teleconference with reporters on Wednesday, Bethlehem Steel head coach Brendan Burke indicated that center back Mickey Daly’s roster rights have been traded to NASL-side Carolina RailHawks for both a loan fee and a transfer fee. Bethlehem announced on July 21 that Daly had been loaned to the RailHawks “for one month with an option for Carolina to purchase.” Since joining the RailHawks, who are currently in seventh place in the 12-team NASL, Daly has made six appearances, including four starts, playing 426 minutes. While commenting on another matter Coach Burke also indicated that part of the reason the organization was open to Daly’s departure was to clear space next season for Mark McKenzie to have a chance to receive high quantity, high quality game minutes. Burke compared McKenzie’s anticipated situation for next year to Auston Trusty’s in 2016. McKenzie is recovering well from his current injury, but it will be tight whether he sees the field for the Steel again this season. In the context of the conversation, Burke juxtaposed McKenzie’s name not only with right center back but also with right back, and mentioned when questioned that Ryan Richter has had some experience at center back. Burke also pointed out that end-of-season conversations between the organization and each individual player have obviously not yet occurred, so speculating about next season is precisely that, speculating only. A bit disappointing they could not get a solid player back in return for the former USL all-star. Did Burke comment on the goalkeeping situation, and how there was a new guy posted on their webiste? Coach made no comment on what follows. Purely by analogy to McKenzie’s situation and Trusty’s before him, McMaster may have subbed on before Luchini to help judge whether he is ready to have a spot cleared for him as well, but coach did say that these young guys can be remarkable in their inconsistency of performance. Coach did say that Anthony Fontana was held back at home deliberately as he will face a tough endurance challenge this weekend, 20 hours on the bus and back to Louisville with a game sandwiched in the middle, Sunday to sleep off the trip, Monday as a regeneration day and then Tuesday away to Harrisburg to play the City Islanders. He also indicated that Bolu Akinyode’s ability to cross the border into Canada rests with the U. S. State Department, that he believes the intervention of a Congressman has been tried, and that the matter is more complex that applying for a passport. Further he did not explain in courtesy to the privacy of a player. Coach did not specify the schedule, I am guessing it from previous explanations of away schedules in June. Saturday Tuesday is a really tight schedule fit if both games are way. Thanks for the info. Strange situation about with Bolu and traveling to Montreal. But just to clarify, Burke did not say if Perrella signed a contract with steel or not? Sounds like he’s here on a three game contract or something like that. It means he’s got some kind of conviction.